This one’s pretty self-explanatory. You can get an STD by being sexual with someone who also has an STD. Both partners should share their sexual history and wellness before being together. If your sexual partner has told you that they have an STD, it’s best to get tested. Many STDs can be cured with a strong round of antibiotics or other prescription medications. 2. You’ve had multiple partners. Another reason STDs are common is because some people don’t keep track of their partners. When individuals have multiple sexual partners, their risk for STDs increases. If you are not in a monogamous relationship or have just gotten back into the dating scene, consider adding an STD panel to your yearly round of tests to keep yourself well. 3. You’re not 100% positive your sexual partner doesn’t have an STD. Even if you’re getting married or you are in a long-term relationship, it’s a good idea for you and your partner to get tested. This ensures 100% certainty that neither one of you has an STD that you could pass to the other. 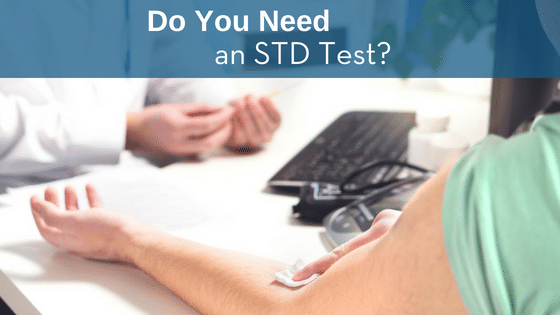 If you cannot say for sure that you don’t have an STD, get tested. 4. You’ve used intravenous drugs. Some STDs, like HIV, can be transmitted through sharing needles during drug use. If you’ve used intravenous drugs, consider a rapid HIV test to determine if you’ve been infected. 5. There was an extramarital affair. Nobody wants to admit that they’ve been cheated on or have been unfaithful. However, if your spouse has cheated on you or if you have been involved in an affair, get tested. Knowing your sexual health for certain may soften the blow, even if it doesn’t make anything any easier. 6. You’ve been involved in a male homosexual relationship. Homosexual men are the most at-risk group for contracting HIV/AIDS. That’s why we encourage anyone who’s engaged in a homosexual relationship to get tested for HIV. If you find out you’re positive, there are medications available that can help you manage the disease. LOOKING FOR RELIABLE HEALTH AND WELLNESS TESTING? CONTACT TEST SMARTLY LABS OR CALL (816) 800-9699 TODAY TO MAKE AN APPOINTMENT AT ANY OF OUR 5 KC-METRO LOCATIONS! Previous ArticleAre You Concerned That You Bruise Too Easily?